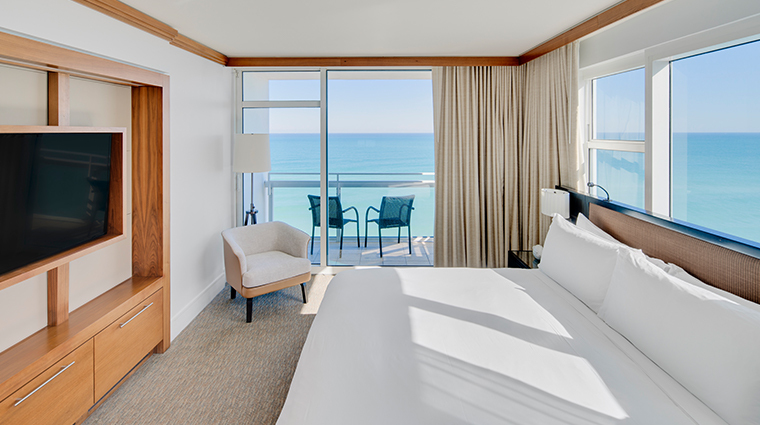 The all-suite oceanfront Carillon Miami Wellness Resort is a true haven in the tropics. 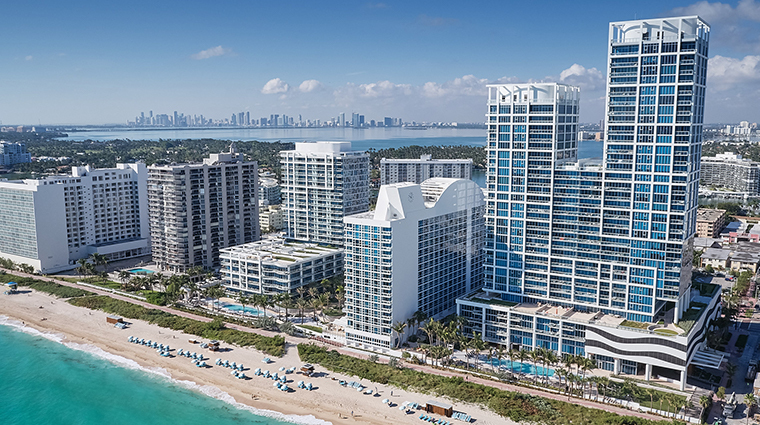 Located along Collins Avenue in the idyllic North Miami Beach (or NoBe) area, it’s away from the hustle and bustle, but just a quick car ride away from the action on SoBe. 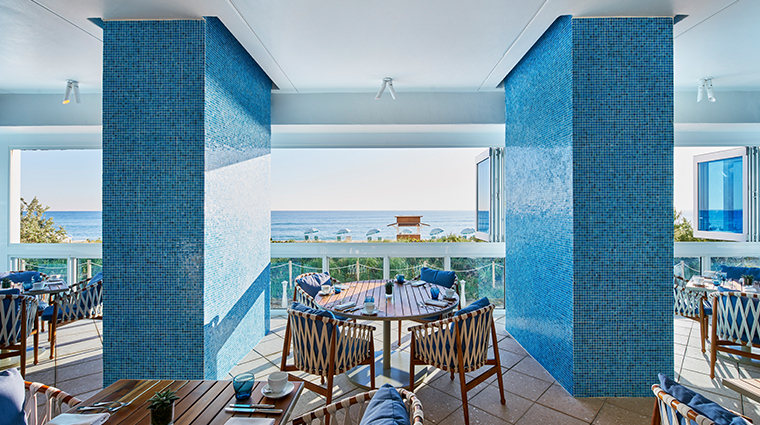 Carillon sets the bar for lavish lifestyle destinations. 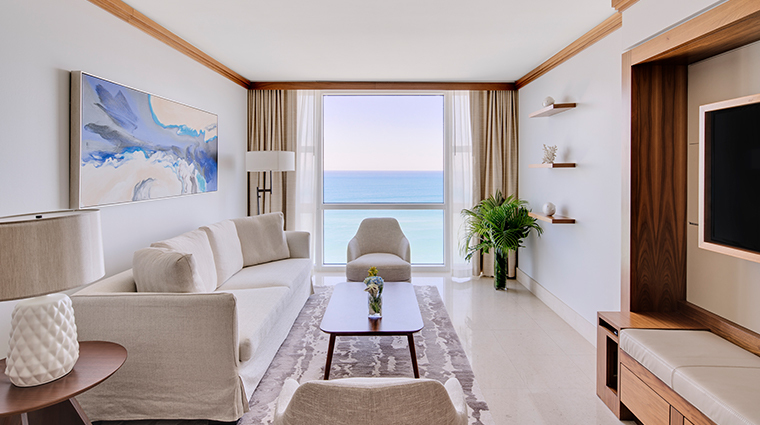 More than simply a place to stay, this upscale resort is the place to go for anyone looking to get away for relaxation and recreation in an elegant, modern yet comfortable beach setting. 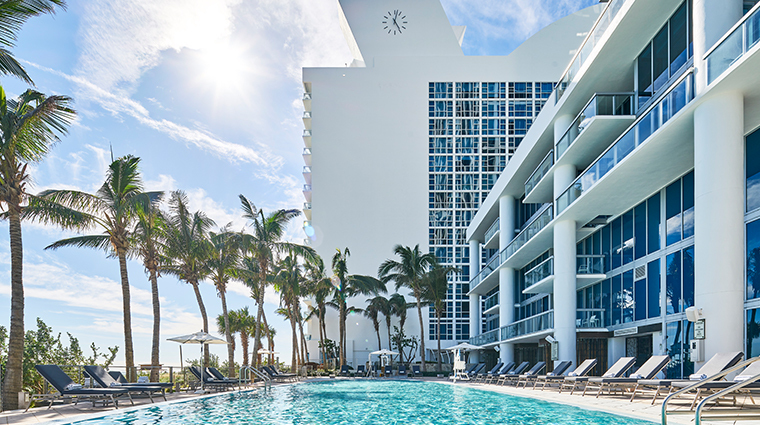 Everything at this historic Miami Beach fixture is grand in scale, starting with its nine-acre sprawling campus. 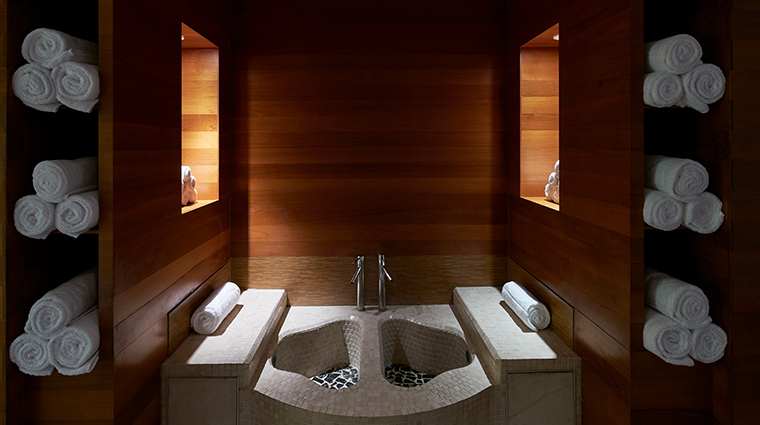 But its take on approachable luxury makes it welcoming and unpretentious. 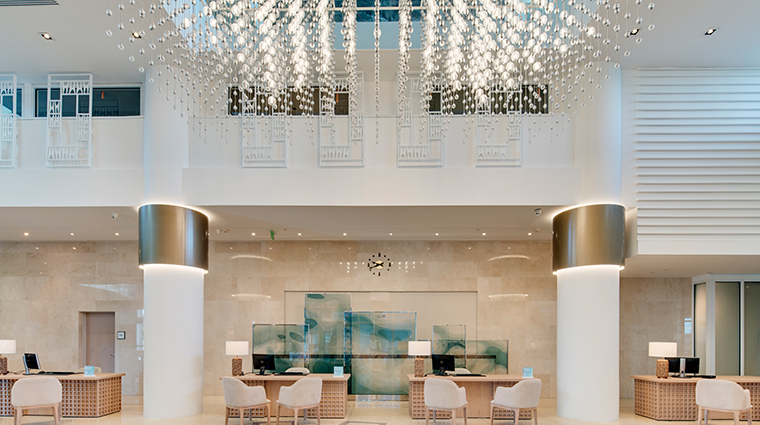 Instead of a traditional check-in counter, attentive staff invites you to take a seat at a private desk area and offers tea and water while a personal concierge explains the resort. 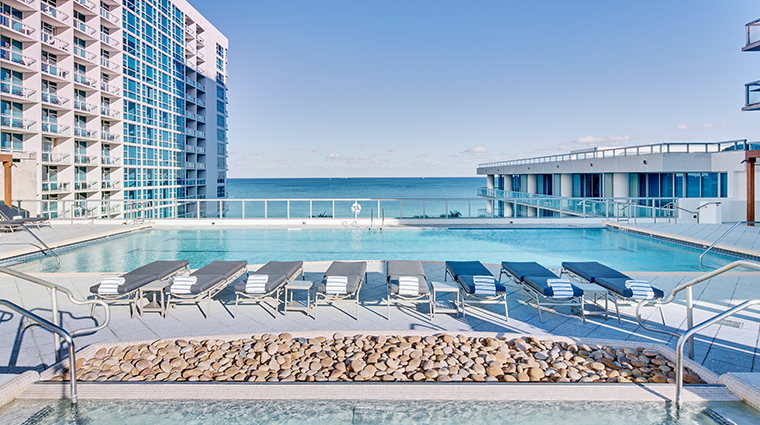 Take a dip in one of the four sparkling, freshwater pools strategically situated throughout the property: Start your day at the Sunrise Pool, take an aquatics class at the adult-only rooftop Atlantic Pool, head to the Cabana Pool for lunch and watch the moon rise at the Sunset Pool. 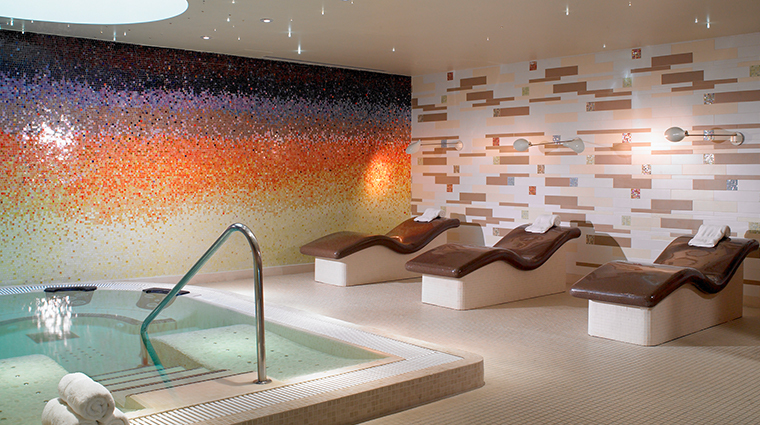 Set in a multi-story 70,000-square-foot facility, The Spa at Carillon Miami Beach is the largest luxury spa in South Florida. 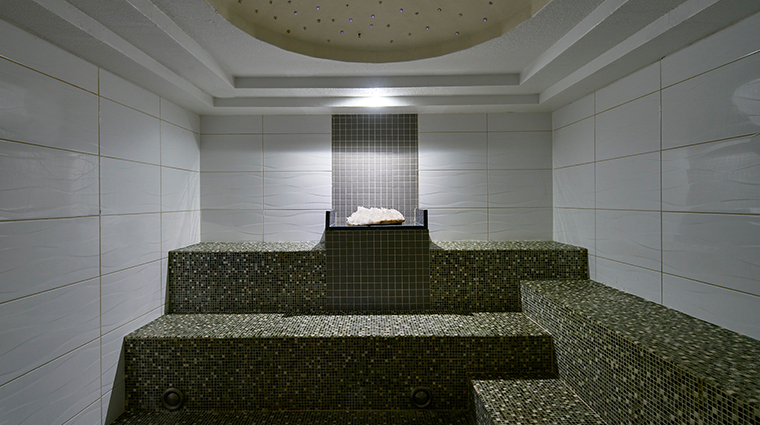 The extensive spa menu offers more than 40 spa services, anchored by the unique Thermal Experiences and Signature Spotlight Experiences. 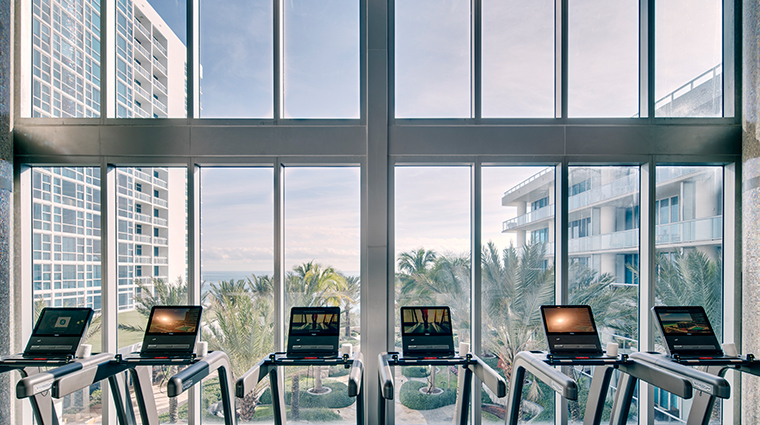 You’ll also find top-of-the-line fitness studios located throughout the property and more than 20 complimentary indoor and outdoor fitness classes and mind/body classes daily. 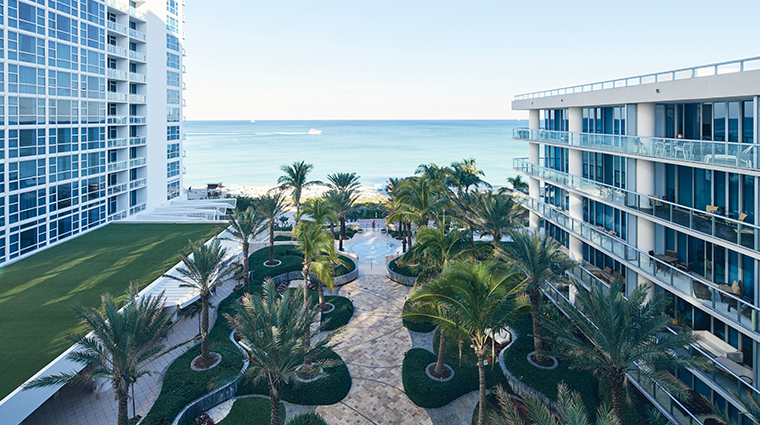 With an array of recreational activities, four dining venues, complimentary lectures and workshops, an unrivaled spa and a full workout facility, there’s something for everyone. 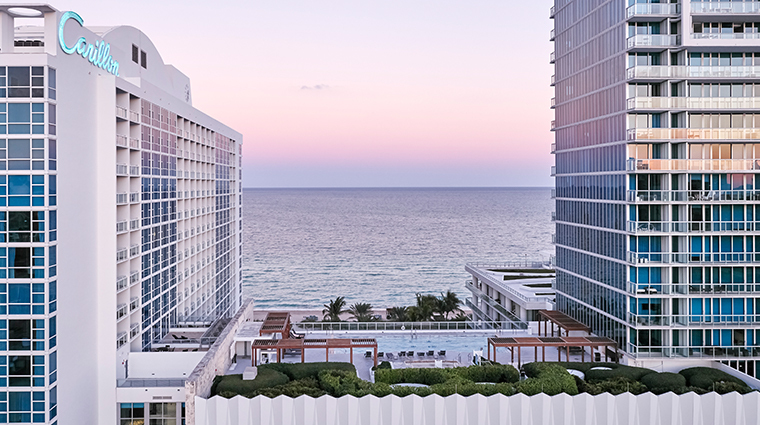 For the perfect photo-op, catch a sunset cocktail on the ocean-side terrace at The Strand Bar & Grill. 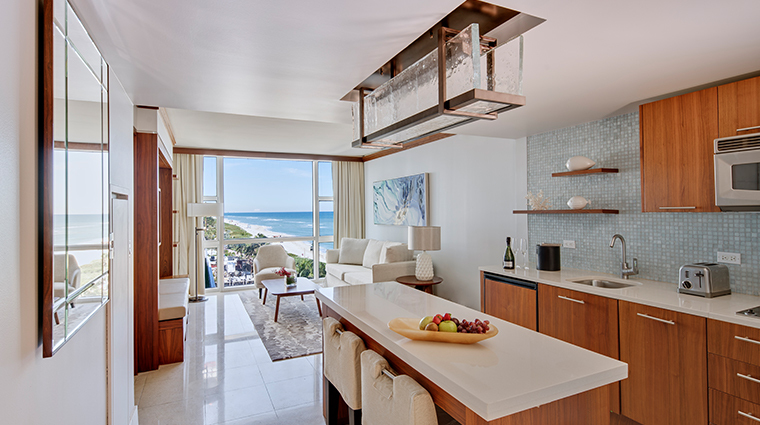 Carillon features 150 spacious one- and two-bedroom suites ranging in size from 720 to 1,200 square feet, set within the resort’s North and South towers. 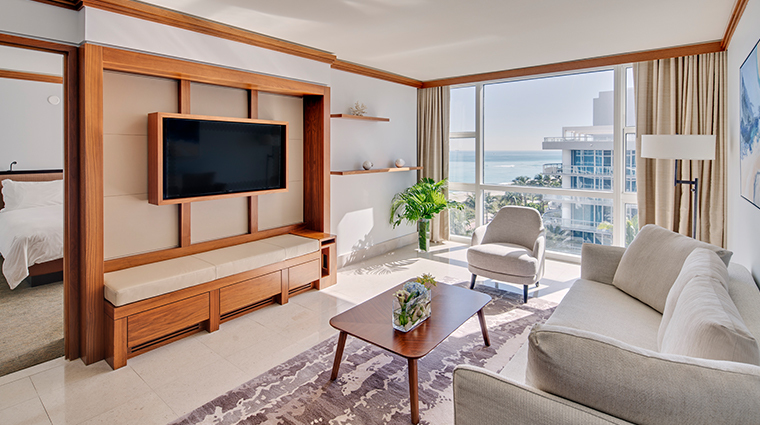 All suites are decked out with everything you’ll need for your stay: a fully equipped granite counter kitchen, a separate living room, a deep-soaking tub, an incredibly sumptuous bed with decadent 400-thread-count Mascioni linens, and plush Mascioni robes and slippers. 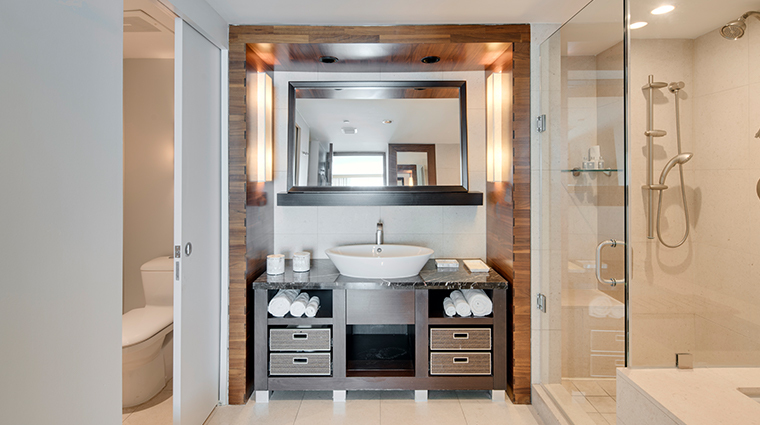 The décor creates a spa-like vibe, incorporating a neutral palette of serene blues, warm wood furniture, soft lighting and Italian glass mosaic tile and stone flooring in the bathroom. 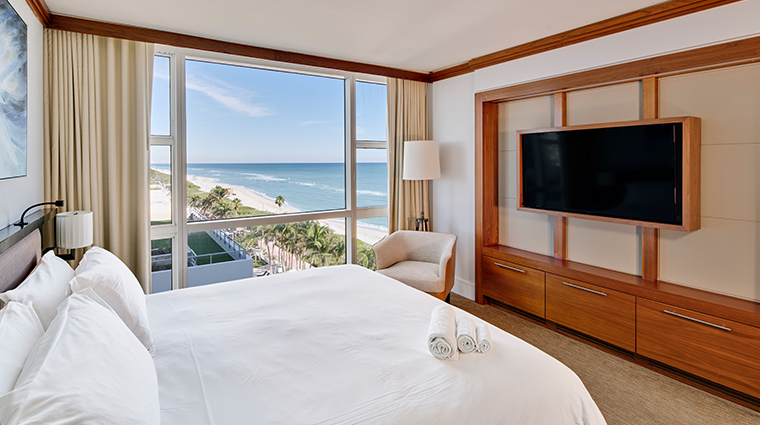 Just draw back the blinds to take in the ocean, beach, pool or city skyline views. 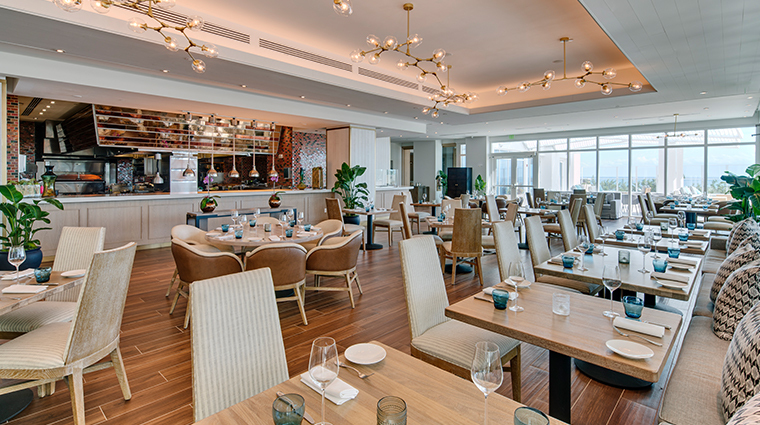 The Strand Bar & Grill is the resort’s casually elegant signature restaurant serving seasonal cuisine catering to both foodies and the health-conscious. Flavorful dishes include roasted Romanesco cauliflower with sumac-tahini vinaigrette, orecchiette with foraged mushrooms and summer truffle, and a Mediterranean-inspired branzino served with artichokes and tomato confit. A selection of simply grilled meats and seafood ensures that even the pickiest eaters will be satisfied. 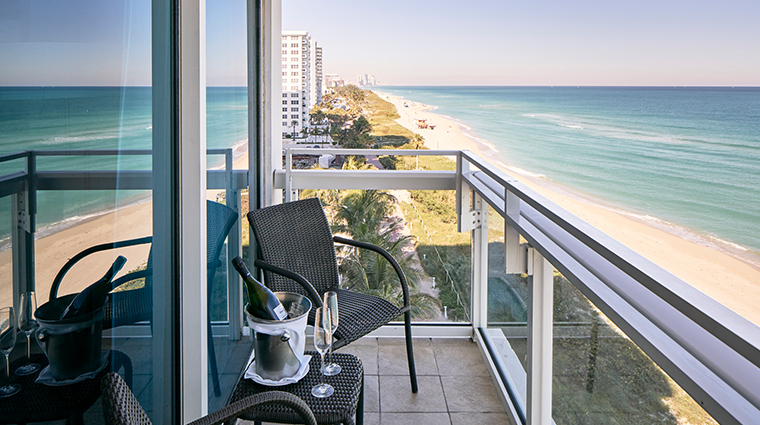 The Atlantic Ocean forms a spectacular backdrop for breakfast, lunch, dinner, or Sunday brunch at the Miami resort’s signature eatery. 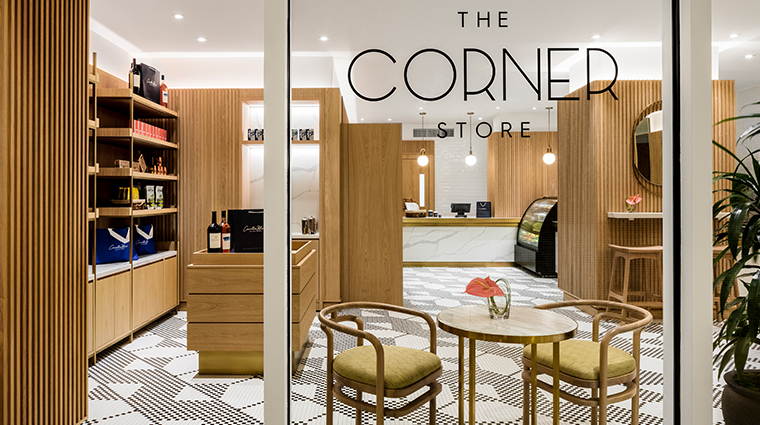 Head to The Corner Store for freshly made juices and smoothies that are designed to maximize health benefits, ranging from increased energy to detox to weight loss.